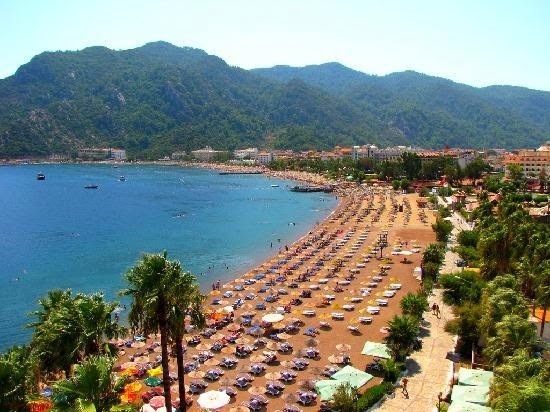 Once a sleepy fishing village, Marmaris has ballooned into one of the largest resorts on the Aegean coastof Turkey. Little of its history remains, as the town is now a modern development with tourism at its heart and soul. The population swells to a massive 200,000 in the summer, with most hotels, restaurants, nightclubs and shops catering to low-cost package holidays, although there are facilities for all budgets. It is thought that the first settlement in Marmaris, whose history dates back to 3400 BC, began with the arrival of a tribe in to the region, whose leader was called Kar. The area was then called Karla after him, and its location around the Aegean and Mediterranean Seas always made it an appealing region. Suleyman the Magnificent assembled a force of 200,000 in 1522, whilst launching the siege of the Knights of St John’s base in Rhodes (Rodos). Soon afterwards, he made the city more powerful with the rebuilding of the tiny castle overlooking the town. Lord Nelson and his entire fleet sheltered in the harbour in 1798, en route to Egypt to defeat Napoleon’s armada at the Battle of Aboukir. Summers are extremely hot and dry, with daytime temperature reachs up to 35 degrees, and the winters are warm and wet, plunging to 5 degrees at night. The area is quite typical of a Mediterranean climate.